Coral Value is a research project funded by the Norwegian Research Council (funding ended in 2015). The project aims to estimate a monetary value of the ecosystem services cold water corals provide. A bio-economic model will be used to calculate their contribution to the wealth created in the fisheries. This information will be supplied by a survey allowing input from the public on their opinions regarding whether and why these structures should be protected. The combined results from these studies will give input to cold water coral management in Norway within an ecosystem based management framework. Fishers and scientists have known for more than 200 years that corals are not only found in tropical areas. After pulling up parts of corals from the deep for hundreds of years, the first video images of cold water reefs in the Barents Sea were taken by the Norwegian oil company Statoil in 1982. These images had a major impact on biologists, fishers, NGOs and policy-makers leading to implementation of protective measures within a year after detection of cold water coral damaged by trawling. While this offered protection to some coral reefs and prohibited deliberate damage of corals, these ecosystems are still threatened. Cold water corals grow very slowly and it would take hundreds to thousands of years for these structures to regain their ecological role if damaged. Little is known about cold water corals and their role in the ecosystem. They are generally not accessible for recreational use and are not as famous as their tropical relatives. Consequently, it is difficult to assess how they contribute to human welfare, and thereby determine how they should be managed given the costs of monitoring and that protective measures will have a negative impact on commercial activities. Valuation is a management tool that can be used for evaluating such trade-offs. This involves identification of ecosystem services describing how ecosystems contribute to human welfare. Secondly, the values of these services are quantified or at least qualified and, where possible, a monetary value is calculated. We asked people who participated in the valuation survey conducted as part of the project what associations they had to cold water corals. 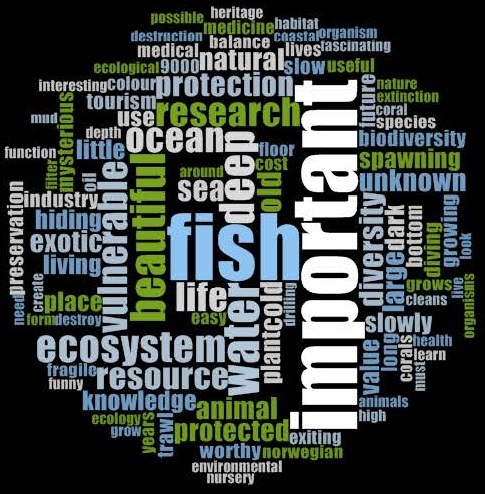 The world couds to the right illustrates that they put a high emphasis on the importance of these ecosystems and, as supported by the analysis of the valuation survey, people regocnise their value to fish. "Unknown", "beautiful" and "resource" were other words that were often listed. What do people think about cold water corals?